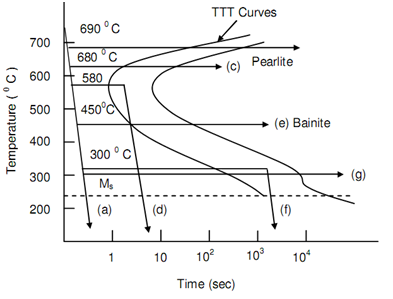 Illustration .3 Heat treatments as mentioned underneath are specified to thin steel strips for that TTT diagram is as represented in figure of Cooling Scheme. What will be the resulting structure of steel in every case? i. Water quench to room temperature. ii. Hot quench in molten salt to 690oC hold for 2 hours and water quench. iii. Hot quench to 610oC and hold 3 minutes, water quench. iv. Hot quench to 580oC, hold for 25 minutes, water quenches. v. Hot quench to 450oC, hold for 1 hour, water quenches. vi. Hot quench to 300oC, hole for 30 minutes, water quench. vii. Hot quench to 300oC, hold for 5 hours, water quenches.